A treat for Mum this Mothering Sunday! We are marking Mother’s Day by offering youngsters the chance to take their Mums on the bus for free. We will provide complimentary travel for Mothers travelling on Sunday 31 March - as long as they are accompanied by a child buying a dayrider ticket. 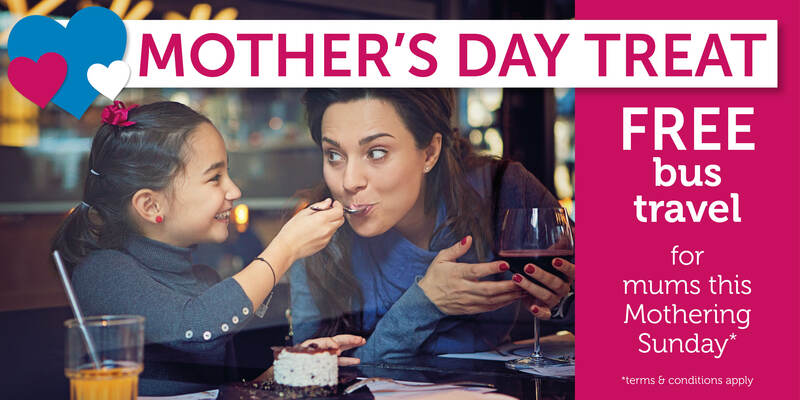 Mother’s Day is about spending time together as a family - and many children like to treat their mums to a well-deserved day out - perhaps into town, to the cinema, or for a meal. Now that the days are getting longer and spring is upon us, it is a fantastic time for a stroll along the beach. Our team is looking forward to seeing lots of mums out and about, being treated by their children on 31st March - and we hope they all have a brilliant day together.